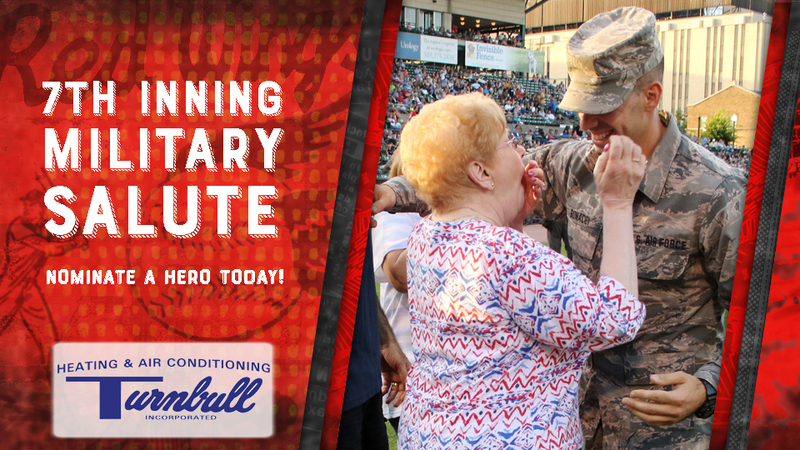 The Rochester Red Wings have teamed up with Turnbull Heating and Air Conditioning to honor local veterans and active military members as part of the 7th Inning Military Salute in 2018. The Red Wings will recognize a local military member, active or retired, on the field prior to the playing of God Bless America after the top of the 7th inning is over. Through the partnership with Turnbull, each person who is honored will receive two free premium tickets to that night's game, VIP parking and 25 Diamond Dollars, which is ballpark currency that can be used at the Red Wings Team Store, Ticket Office or concession stands. For more information or to nominate an active military member or veteran please contact Travis Sick at (585) 454-1001 ext. 3042 or TSick@RedWingsBaseball.com. The 2018 season begins Friday, April 6 when Rochester hosts Buffalo at 6:05 p.m. Single-game tickets for all 70 games, including Opening Day, are on sale now at RedWingsBaseball.com. The Ticket Office will open for the first time on Friday, March 23 for the 2nd Baseball's Back Bash.